The 2.0 TDI engine belongs to the EA188 family. This engine is the redeveloped 1.9-liter TDI engine. 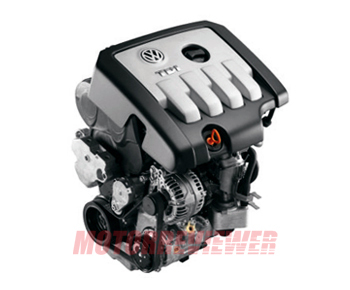 The 2.0-liter TDI was the first Volkswagen diesel engine with four valves per cylinder used in 2004 Golf, Passat, and another vehicle. The cylinder block is made of gray cast iron. The increased displacement of the engine was achieved by resizing the bore up to 81.0 mm. The engine has balance shafts, forged steel crankshaft and fracture-split forged steel connecting rods also. The 2.0 TDI engine got entirely new aluminum 16-valve cylinder head with double overhead camshafts (DOHC) driven by timing belt. The outstanding feature is what the timing belt drives exhaust and intake camshafts together. The engine is equipped with Pumpe Duse (PD) direct injection (DI) fuel system (not Common Rail) and turbocharger made by Garrett. 1. The oil pump drive shaft had some defect. The oil pump stop working and the first what will break is turbocharger. 2. High oil level. The particulate filter is an issue. When the particulate filter becomes clogged with soot, the fuel in the engine does not burn completely and drains into the oil pan. That increases an oil level. AZV, BMA - 136 hp (100kW) engine. BKD, BKP, BRE - 140 hp (103kW) most popular engine . BMN, BMR, BRD - the most powerful 170 hp (125kW) and 258 lbf ft of torque engine with diesel particulate filter.